My First Read-Along Easter Story is a great way to introduce the story of Jesus' Resurrection to young children. Vibrant illustrations and easy-to-read text simply explain the last week of Jesus' life, including His entrance into Jerusalem, the Last Supper, the crucifixion, and the Resurrection. Also included is a music CD featuring the story, word for word, plus Easter hymns and favorite Bible songs. 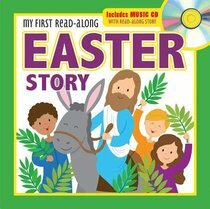 About "My First Read-Along Easter Story: Includes Music CD With Read-Along Story"